Two Sundays ago, my husband and I packed our Honda Odyssey with clothes, food, linens, and more beach toys than necessary, loaded up our three kids, and headed off to Virginia’s Eastern Shore on vacation. 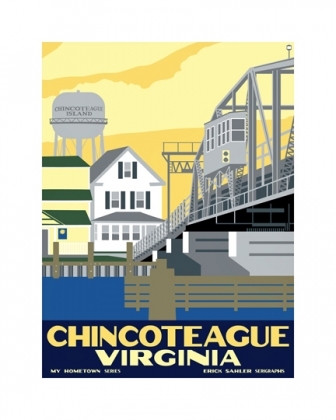 Unlike other coastal areas, the Eastern Shore is relatively underpopulated, with the exception of Chincoteague, a small island (9 sq. miles small) that thrives on oysters and tourism. You may recognize it from the Misty stories by Marguerite Henry, but the broader area also includes a nature preserve (neighboring Assateague Island), NASA’s Wallops Flight Facility, lighthouses, and miles of sandy beach. We were lucky enough to find a cottage that was not too big, not too little, not too fussy and not too minimalist. It was perfect for our family and gave us an chance to sample island life for a few days. We took plenty of nature walks (for dad), investigated local history (for mom), and found ourselves at the water nearly every day (for the kids). On our way home, we even got to swing through Washington D.C. for a night. 1. Ecology: Scientists tell us that coastal erosion is a serious problem—at one point Assateague beach was eroding a full 35 feet a year. And while there are many contributing factors, mothers know that one cause is of coastal erosion is simply that beaches are being transported further inland via cars, suitcases, tennis shoes, and sleeping bags. 2. Economics: When apportioned a certain amount of spending cash, children will inevitably want a souvenir that is just beyond said budget. Parents will inevitably find a way to make up the shortfall. The US government has been operating on this same principle since its inception. 3. Psychology: In order to ease the transition back home, you must end vacation in a place outside your comfort zone—like Washington D.C. Given the serene pace of island life, 0 out of 5 people want to leave by Friday. But, if you spend at least one night inside the Beltway, studies predict that 4 out 5 people will want to go home ASAP. 4. Cosmetology: Beach hair will only ever look good at the beach. The minute you re-enter civilization, your "waves" will simply look like you haven’t washed your hair in days. The only exception is if you’re a Hollywood A-lister, in which case, your Prada dress and Jimmy Choo shoes will signal that your messy locks are intentional. 6. Linguistics: Reading can tell you a lot, but it cannot tell you how to pronounce the name of the area you are visiting. Consequently, you will spend several months incorrectly telling people you are going to “Ch”ink-a-teague, only to realize that it is pronounced “Sh”ink-a-teague. You will discover this the day before you leave the island, and as a result, take every possible opportunity to pronounce it correctly in an act of penance. 7. Human development: Even on vacation, children need structure and naps. Five-year-old children in particular. 8. Culinary Arts: If you decide to splurge on one dinner out—say, at a restaurant overlooking the water where you can sample the ocean’s freshest offerings for an exorbitant price—do not expect your children to join in the fun. Hot dogs are on the menu for a reason. 9. Statistics: Given the opportunity to play Ticket to Ride every night, children will ask to play Ticket to Ride 99.4% of the time. 10. Penmanship: The most effective way to learn your letters and numbers is by writing them in the sand with your finger. Unfortunately for our 5yo, writing your name on something (say, the beach) does not necessarily entail ownership of it. In a day when it’s easy to project false images of our own happiness, I hesitate to post about my family enjoying one the most idyllic vacations we’ve ever had. I don’t want you to think that life is always this beautiful for us. But this week it was. And for that, I am grateful. We came home with our heads full and our hearts fuller for the time spent together. And now, it’s time to get back to normal.